Metal Club Mökä's clubroom is located in Jämeräntaival 7 A, Otaniemi, Espoo. 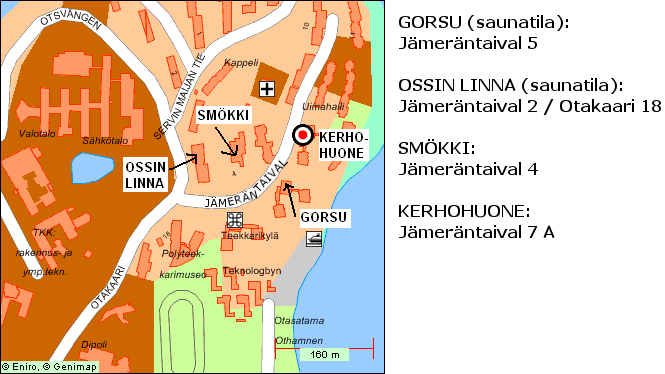 This is a map of the surroundings, the red dot is the clubroom. The clubroom is the first door on the right after the front door, you can't miss the logo. Restroom is located on the left further down the hall. Mökä's members can use the clubroom and its equipment, but certain rules must be obeyed. 1. Metal Club Mökä's members can use the clubroom. If you want into the clubroom, contact the board. 2. Equipment must be returned to their places after use and trash must be picked up. 3. The clubroom is not for storing of personal belongings. 4. Personal belongings will be thrown away if they stay in the clubroom for too long. 5. The club won't take any responsibility for any personal belongings brought or left to the clubroom. 6. The club members are responsible for any non-member guests they bring to the clubroom. In the clubroom there are three sofas, a gas powered BBQ grill, a refrigerator, a coffee maker, a microwave, a desktop computer, a video projector and of course speakers for playing metal music. There are also yard games: croquet, petanque and Finnish "Mölkky". If you have ideas concerning the clubroom equipment, contact the board! Our interest to improve the clubroom experience is as big as the Cold War. We use the clubroom mostly for afterparties after Mökä events, but occasionally we hang out there at other times, especially in the summer (BBQ!). If you want to know if there is anyone at the clubroom, contact our Facebook page (or the board email list, which can be much slower).